I think they got me good with their marketing. In the past month I got to stay at the Park Hyatt Tokyo and The Ritz Carlton Kyoto for free as a benefit of using their branded credit cards. Certainly they did not lose money on the whole deal because I ended up spending pretty heavy at each place. For example we went out and spent a good $258.39 at the hotel bar on several hand carved diamond ice infused cocktails (the video is from bar high five, but you get the point). …and yes I did it for the sweet 5x points for 1,291.95 RC rewards points to use at a Marriott. Earlier in the month we ended up staying the entire day pampered on the top floor of the Park Hyatt on a rainy Tokyo day with the best American breakfast anywhere in Tokyo as well as 6 hours at the spa. So there was another $818.69 spent at a hotel that I would of never set foot in if it wasn’t free. …but check out the sweet 3x points per $ for 2,456 Hyatt points to use at any of their more reasonable properties. So in the end the Hotel gets to fill some empty rooms and get paid on their other hotel services. It makes me wonder if the room rate make them any money at all. I assume most of the weekdays these rooms sit empty, yet the overhead remains the same as you have the same staff on salary. I certainly see why they have such good benefits on their branded cards. I really gives them a chance to showcase their properties. I am starting to see the same thing with car rental companies. I follow this point guy on my Facebook and ended up getting a link to Sixt car rental elite platinum status as a benifit to my World Elite MasterCard from Barclay Arrival Plus. Never heard of these guys, but what the hell, I have Platinum Status with them, might as well check them out! 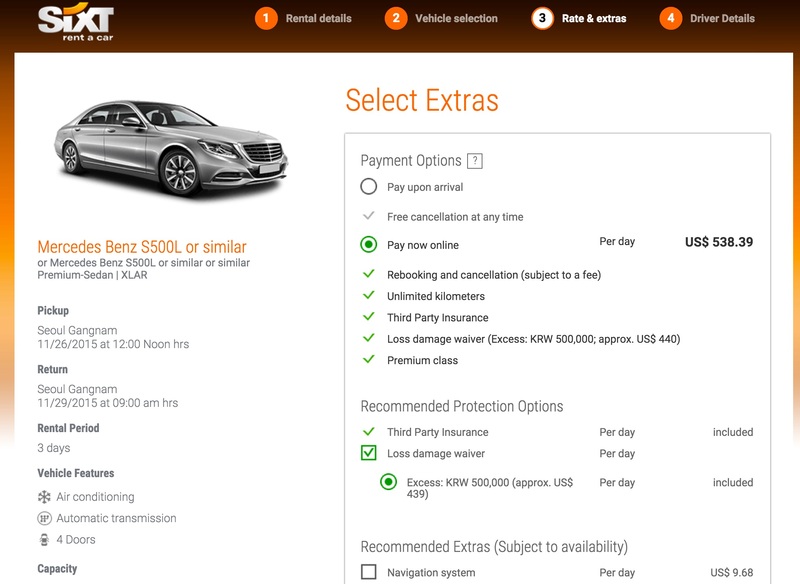 Yup, you can rent a Porsche or a MB s500 in Seoul Gangnam. Apparently you get 15% off the daily $538 rate! Eh, not worth it even for the 2x Ultimate Reward Points on Chase Sapphire Preferred.